It took a while, but Skype has now released an application for Android smartphones, enabling users to make free calls to other Skype users and send and receive IMs, one-to-one or with a group. The Android app works over WiFi, 3G, EDGE and GPRS, and comes at a cost that’s hard to beat – gratis. Big caveats: you can only make calls over WiFi in the United States, and the app is not available in the Android Market in China or Japan. Skype teamed up with Verizon last February to introduce Skype Mobile, including for Android phones, exclusively for the US carrier’s customers. Also worth noting is that there are known issues with Skype Mobile for the Samsung Galaxy S, which the company says are being investigated. Not much to add to the news, apart from the fact that you’ll need a phone with Android 2.1 or above to be able to download the app, which you can do from Android Market or by visiting Skype.com/m from your phone. 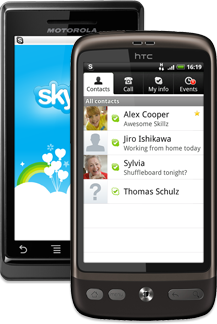 Skype is now available on three of the most popular mobile platforms today: Android, iOS and Symbian. Of note: Fring yesterday announced an Android version of its FringOut program, enabling users to make calls at $.01 cent/minute over any data connection (WiFi, 3G and 4G). No matter which service you prefer, it’s been a good week for Android users so far. On a sidenote: Skype yesterday announced that it has appointed a new CEO, Tony Bates, a senior VP at Cisco – the company filed to go public last August.